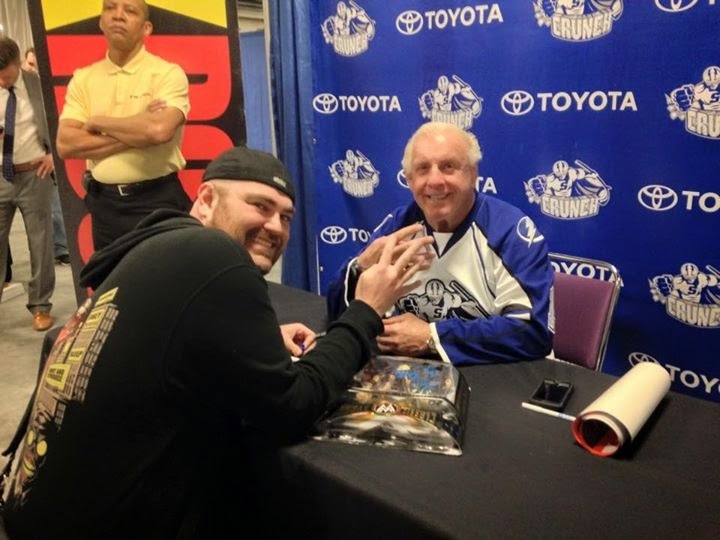 The Horror Movie BBQ: Meeting Ric Flair! Never has that line rung more true when it comes to Ric Flair. 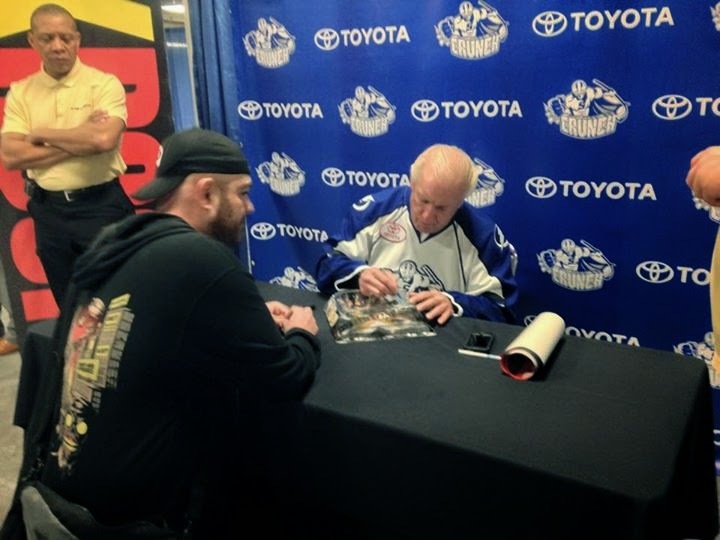 The 16 time world champion and pro wrestling icon came up to my neck of the woods to come meet and greet his fans at the Syracuse Crunch minor league hockey game in beautiful downtown Syracuse! Ric and a Crunch official. I took the risky drive from Rochester to Syracuse in the snow to come meet the legend himself. An hour and a half drive in the snow turned into a lot longer but I had to make this happen. Not to get too much into my personal life, but the past year has been filled with me having to cancel every event that I may have had planned. On top of that, I had back surgery in October so an hour and a half drive was not going to be too fun. But, I decided I had to attend this. If not just to get some stuff signed, but to slowly get back in the swing of doing more events all around. So, after a slippery trip on the New York Thruway, I finally made it. I hooked up with my buddy John, who I've become friends with via a autograph collecting forum called MarkedOut. He and I have always bonded over our love of pro wrestling and since this was a free signing, I knew he'd have to attend. It's always great to see him, which I rarely get to do. We caught up, discussed our hopes for WWE, and signings we've attended. When I got to the Syracuse Crunch game, held at the War Memorial Arena, the line was pretty massive. But for seasoned pros like John and I, being 50 in line was nothing, In fact, it was a good spot for us. My hope was to meet Flair and get back to Rochester as quick as possible before more snow hit. So, I arrived around 6:30 to meet up with John in line. And after Flair met with the VIP's who paid extra to get a more intimate experience with the Nature Boy himself in another part of the arena, he came downstairs where all his fans were waiting. It was actually pretty sweet setup. The basement of the arena had carpeting instead of just solid concrete, which was awesome on my feet and back. Fans brought items of all sorts including books, figures, belts, dvds and so much more. It was interesting to see who brought what and what the reasoning behind it was. I brought a photo op from the first time I met Flair in 2008 at the Washington Auto Show in DC as well as a Classic Superstar two pack featuring Barry Windham and Flair. 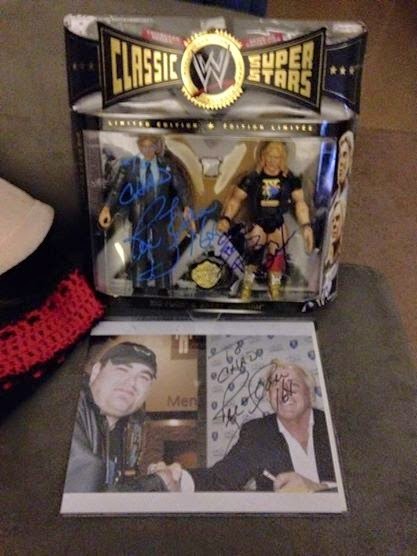 The two pack had already been signed by Barry in 2009 and I've been waiting to get it signed by Flair since then. A little under an hour and it was our time to meet the man. I got to shake the man's hand and told him what a thrill it was to meet him again. After Flair signed my photo op, I was told by security "Only one item". But, I've been waiting too long to get the figure signed and Flair was impressed that it was signed by Barry so he offered to sign it on his own accord with my blue paint pen. Finally. After 6 years, I finally completed this two pack. I was so excited. And even after that, Flair was still willing to throw up those 4 fingers for a photo op! I can't say enough nice things about Ric. He was willing to welcome everyone with a smile and a handshake and seemed to really enjoy meeting his fans. He time to take photos with everyone who stopped by, no matter what number in line they were and willing to sign each item that came across the table. At this point, I bid farewell to Mr. Flair and my buddy John. It was time to have a quick cigar and head back to Rochester. Thankfully I had Nerd Lunch and Adam Carolla podcast episodes to keep me sane during the two and a half hour drive. The drive was pretty stressful but it was worth it because I got to meet one of my all time favorite wrestlers again, complete an autograph project, get a sweet photo, and hang out with a great friend. And most importantly, I was able to get back in the swing of things when it comes to driving and attending events. Also, considering Flair normally charges $40 for an autograph or a photo at conventions, paying under that for the entire trip, gas, tolls and ticket included, it was a no brainer that I had to attend. It was a great night. 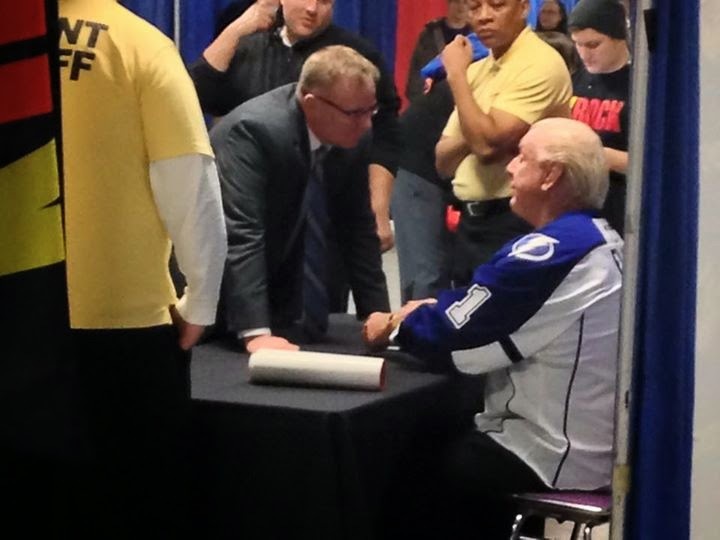 If you have the opportunity to meet Flair, don't pass it up! My loot. No, I'm not bothered by the fact that Flair signed over his face. To be the man, you have to meet the man! WOOOO! Did you know that you can create short links with AdFly and receive money for every visit to your shortened urls.